Soil is living medium and it acts as a precarious reserve in agriculture and food production. To enhance crop yields for ever-increasing human population, chemical fertilizers are being applied in the soil. But, the haphazard usage of fertilizers, predominantly nitrogenous and phosphorus, headed to considerable contamination of soil, air and water. Moreover, unwarranted consumption of these agrochemicals also cause lethal effects on soil microorganisms and disturbs the soil fertility. Due to current public apprehensions about the side effects of these agrochemicals, understanding plant and rhizospheric microbial interactions is gaining momentum. 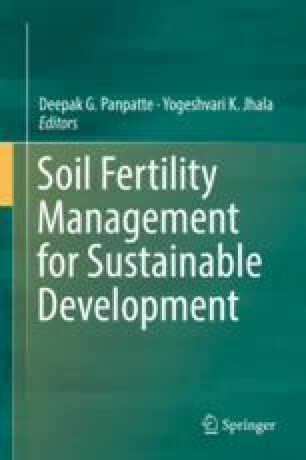 It is considered to be important to effectively manage level of nitrogen in soil through biological nitrogen fixation (BNF) to maintain agricultural sustainability. The fixed N is directly taken up in the plants and is less vulnerable to volatilization, denitrification and leaching. Thus, mutualistic symbiosis amongst legume plant and nodulating rhizobia plays a key role in ecological environments. Legume-rhizobia symbioses provide approximately 45% of N used in agriculture and contributions of BNF from the symbiotic association accounts for at least 70 million metric tons per year into terrestrial ecosystems. In agricultural systems, about 80% of BNF contributed by symbiotic association made between leguminous plants and species of Rhizobium, Bradyrhizobium, Sinorhizobium, Azorhizobium, Mesorhizobium and Allorhizobium. The populations of these root-nodule forming bacteria can be changed ecologically, agronomically, edaphically and genetically to increase legume production and soil productivity. Moreover, legume-rhizobia symbioses also provide non-polluting and economical ways to augment N2-fixing potential under stress conditions. Scientists have identified numerous symbiotic systems tolerant in harsh situations of salinity, alkalinity, acidity, drought, toxic metals have been recognized and alteration in rhizobial population under stressed environments can be an indicator of soil fertility. Moreover, interactions among rhizobia, plant growth-promoting rhizobacteria (PGPR) and mycorrhiza as well show significant part in increasing soil fertility and crop yields. In this chapter, significance of biological nitrogen fixation in persistent food supply, influence of extreme environments on legume-rhizobia symbiosis as well as interaction of rhizobia with belowground microbial species are discussed. The eco-friendly approach to increase crop production and soil health by inoculation of symbiotic bacteria as biofertilizers is described for sustainable agriculture.